Iranian weddings have different customs peculiar to Iranian culture. These traditions have been changed many times throughout history and have differed according to social levels, ethnic groups and religions. Nowadays, couples can meet at work places, universities, public places, parties or family meetings. However families still play an active role on finding the right person for their children. Iranian weddings consist of several stages. These stages were different in some regions of Iran, however in most of the regions, particularly in Teheran, these customs still can be seen. It can also be seen that there are modern people who only interest in the marriage part. According to the meetings before, usually afternoon or during sunset time, groom and his family come to the bride's family's house for marriage proposal with desserts. In the beginning, casual conversations are made. After a while, the marriage proposal topic comes up. 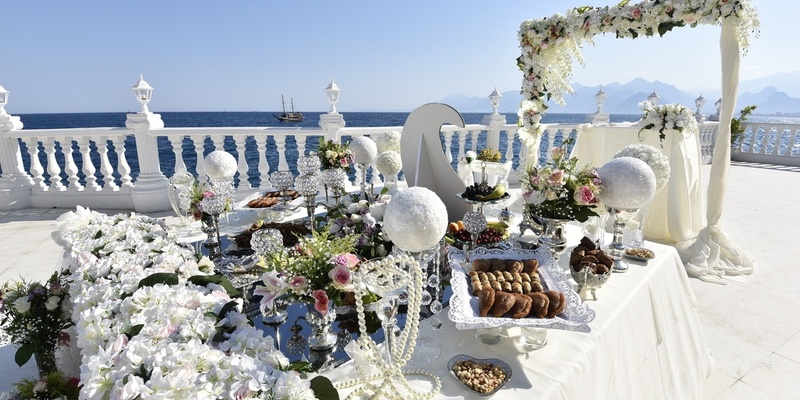 Usually, in this event, the bride to serve tea, candies, and fruits to the guests and answers their questions. Afterward, two families come to an agreement on cultural, social and living standards of the bride and groom. Then, the marriage date is determined. Balya Borne and Shirini Kharan are the ceremonies which are held in the bride to be's family house. These meetings' topic is usually about the bride's dowry and marriage conditions. At Balya ceremony, the groom's family give the bride a piece of cloth, a golden ring and sometimes candies as a symbol of an engagement and these presents also show that the girl belongs to her groom. Sometimes at some ethnic groups' ceremonies, the bride's family also give some money called ''shirbaha'' and this money usually used for wedding costs. All the conversations and agreements should be written on a paper and should be signed by witnesses. Engagement ceremony is usually held after the Balya Ceremony. This ceremony's aim is to show a more official announcement by families on their children's' marriage. Engagement ceremonies can be held at the house or at a small garden with special guests as a special family reception. Like weddings, also for the engagement ceremony, before the ceremony invitation cards should be distributed. In every city, it is the bride's and groom's families' duty to hold a ceremony proper to customs. The subject and ceremony of the Kanan Tree are both important and this ceremony can be held in two different sections. Firstly there should be a ceremony in the bride's family's house. Both parties' women and men members come together usually in different rooms to read the agreement together. This agreement's terms and bride's dowries should be defined in Balya Ceremony. In Kul Kanan Ceremony bride candidate and groom candidates sit side by side in front of a wedding feast(Sofreh Aghd). There should be different kinds of cheese, sugars, desserts, chips, nuts, eggs and yogurt on the table. A two-sided silver shawl should be held on bride and groom candidate's heads. A woman family member should disintegrate two sugar cones on this shawl and small pieces fall on new couples' heads. At the same time, an Aghed (a person who runs the ceremony) reads the agreement after asking the bride and her family for their confirmation 3 times in a row. Usually, before the third and last confirmation, the groom's mother should give a present to the bride and afterward the agreement can be read. Then both parties should sign the legal document which is called Ashd-Nme and consists of the conditions of the marriage, the duties of the bride and groom in this marriage and wedding date. The ceremony continues with gift presentations and entertainments. For this ceremony, it is the bride's family's duty to prepare the dinner, however, flowers, sugar cones, and fruits are in the groom's sides responsibility. This ceremony is for close relatives after the sign of agreement. Gifts are usually presenting at this ceremony. Jahizie or Jahaz is a set consist of household items and accessories which will be needed in married life. During old times, this set has started to be prepared at early ages of the bride to be however nowadays with the developments in technology also, before the wedding ceremony the set is prepared. Before the wedding, women members among close relatives go shopping for accessories. Wedding ring, wedding dresses, mirrors, groom suites.. etc. should be bought. Groom orders lunch and gifts to the close relatives. These gifts called ''Sar Kharidi''. Nowadays these preparations are seen less. Hana-Bandan is a ceremony which is held in the couple's new house one night before wedding night among young relatives and friends. It can be called as a bachelor party. At this ceremony, the groom's family brings fruits, desserts, and decorative henna. At the end of the ceremony guests' and couples are applied henna. Atmosphere is cheerful and ceremony can continue until midnight. The wedding ceremony is a very important and joyful event which all the close and distant relatives attend. It also consists of a magnificent reception. This ceremony's cost is the groom side's responsibility. At the end of the ceremony, newlyweds enter their new house with a group of guests. Usually killing an animal as a sacrifice or special rituals like this can be seen. This ceremony can continue 3 days in some regions of Iran. Pa Takhti ceremony should be held after the wedding ceremony. Nowadays this ceremony cannot be seen so much with the changes in traditions. Only women members of close relatives gather in the bride's family house and are served cakes, fruits, desserts, and soft drinks. Guests bring their gifts to the bride. This ceremony is similar in many ways with the bridal showers in the USA. Moreover, there is a ritual called Madarzan Salam which should be organized the very next morning of the wedding ceremony. Groom goes to the bride's mothers house with a gift, presents his gift to the bride's mother, kisses her hand as a tradition and thanks her. As the last stage of a traditional Iranian wedding, the couple leaves for their honeymoon. Mashhad is considered as the first destination among religious families.